A rollator transport chair can enhance life quality in a variety of ways. It combines the features and benefits of a rolling walker with the versatility of a transport chair. This combination provides mobility, independence, and freedom in the home as well as in many different public venues. When walking safely is an issue due to balance problems, a walker provides the freedom to move around safely without assistance from another person. The wheels on a rolling walker do away with the need to lift the walker to move it forward. This allows the user to walk at a smooth and comfortable pace. Since many rollators provide a tray as well as a generously sized basket, it also allows the user to place things on the tray or in the basket to move them from one place to another without assistance. There are even large handicap walkers for big people. Rollator transport chairs assist with walking and carrying objects just as rollator walkers do, but rollator transport chairs also provide assisted transport when needed. The seat can be used when rest from walking or standing is needed, and if the user is accompanied by another person, he can be transported from one place to another just as he would be in a wheelchair. In the home, the transport chair allows the user to accomplish many everyday tasks without assistance. It can be used in the kitchen to aid in preparing and serving food as well as with cleanup after the meal. General cleaning tasks and hobby activities are made simple with the ability to carry the required products or tools. And, of course, quick transport from one room to another is easily accomplished with the assistance of another person. Shopping, eating out, doctor visits, and attending public events are all made easier by a handicap walker. When accompanied by another person, the user has the choice of walking and carrying things independently or being transported when fatigue sets in or inconvenient distances such as large parking lots are encountered. Every public place that has wheelchair access can be enjoyed by the rollator walker user. But the rollator transport chair owner has greater access to things in public than a seated wheelchair user does. Since rollator chair users can also stand, they are not inconvenienced by service counters that are not low enough for a seated person or product racks and shelves that are too high. In addition, as long as the user is accompanied by another person, she is not limited by stamina or walking distances that cover too great an area. The beauty of the all-in-one rollator transport chair is that it can be used in public places or in the home for both independent mobility and for assisted transport when needed. 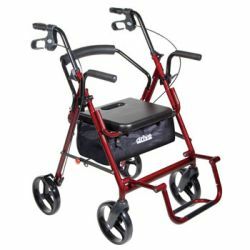 Red Rollator Walker with Seat – This rollator walker has a seat and is perfect for long lines or waiting for the bus when there are no benches around. Blue Handicap Rollator Walker – This is also a push walker that has big wheels, good for outside use. Simple Transport Walker With Wheels – This is a folding walker with two large wheels in the front for maximum stability on grass surfaces. It is highly recommended by many users. 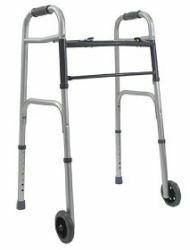 Lift Handicap Walkers – This is a rollator walker that requires the user to lift rather than push. It is the most affordable and simplest to use of all the walkers. For short distances, it does the job, supporting up to 300lbs.